My mom and I have been testing this cream for the past month and we are super excited to share our thoughts of it with you guys. This is the Beauty of Joseon Dynasty Cream aka the Joseon Beauty Cream aka the Joseon Beautiful Woman Cream. While the cream might have many names, it has a clear focus and that it to moisturize, nourish, brighten, and provide anti-aging care. Sounds amazing doesn't it? That's what we thought too. Despite our different skin types, mine being combo to oily, acne prone and sensitive while mom's is normal to dry, we both really wanted to try this cream. So we decided to both try it out for 1 month and come back with our findings. I took a decant of the cream and while my mom kept the jar, which is beautiful by the way. Product Description: A uniquely textured facial cream. Its multi-functional properties include moisturize, nourish, brighten, and anti-aging care. The cream is formulated with natural ingredients such as ginseng, orchid, honey, rice bran, gourd extract, and more. It works to enhance the skin's complexion, improve the skin's elasticity, provide proper moisture and nourishment, and diminish the appearances of wrinkles and fine lines. To Use: As the last step of a skincare routine, apply an appropriate amount onto the face and massage lightly until the cream is absorbed. Ingredients: Water, glycerin, butylene glycol, naicinamide, dipentaerythritol hexa C5-9 acid esters, sodium hyaluronate, xanthan gum, cyclopentasiloxane, cyclohexasiloxane, polyacrylate-13, polyisobutene, polysorbate 20, hydrogenated lecithin, C14-28 alkyl acid, stearyl alcohol, benenyl alcohol, dimethicone/vinyl dimethicone crosspolymer, dimethicone, adenosine, glyceryl stearate SE, cetearyl alcohol, polyglyceryl-3 methylglucose distearate, cetyl PEG/PPG-10/1 dimethicone, stearic acid, tocopheryl acetate, sodium polyacrylate, olea europaea (olive) fruit oil, helianthus annuus (sunflower) seed oil, centella asiatica extract, hippophae rhamnoides (sea buckthorn) oil, human oligopeptide-1 (EGF), argania spinosa (argan) oil, butyrospermum parkii (shea) butter extract, ceramide 3, trehalose, calendula officinaalis flower extract, caprylhydroxamic acid, 1,2-hexanediol, raphanus sativus (radish) leaf extract, oryza sativa (rice) bran extract, cucurbitaceae (gourd) extract, orchid extract, honey extract, panax ginseng root extract, carthamus tinctorius (safflower) seed oil, shea butter (this ingredient is listed twice, not sure why), phytosphingosine, ceteareth-20, glyceryl citrate/lactate/linoleate/oleate, fragrance. 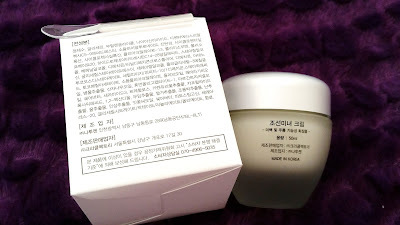 Packaging: We both love the packaging of this Joseon Beauty Cream. The frosted jar looks really nice and the designs are simple yet elegant. We especially love the calligraphy design of the name. The outer box packaging only has information and ingredients in Korean, so a bit of translating was needed. It took a couple of hours, but it wasn't too bad. The cream also came with its own spatula, talk about handy. Scent: The scent of this cream is something else we both liked. Its got floral notes with hints of herbal, and a baby powder like finish. It sounds interesting but smells really nice. If you like floral scents, you'd probably love this. The scent is, however, more than mild and fragrances were added to the cream. So, it might not be suitable for those sensitive to fragrances. Color: The cream is white in color. Texture: This cream has a unique texture. It looks like regular cream and applies like regular cream, but its got a stringy texture. Think cheese stringy. Helen's Thoughts: I remember asking my daughter if there is a cheese ingredient of some sort in this cream while she showed me how stringy this cream can be. She assured me that there is no cheese by showing me the ingredients list. It is not that I do not like cheese or anything, but it just seems odd to apply a melted cheese like texture of a cream on the face. Rest assured though, this cream applies easily. It just melts onto the face when applied. I like to do a light massage to help it absorb into my skin. 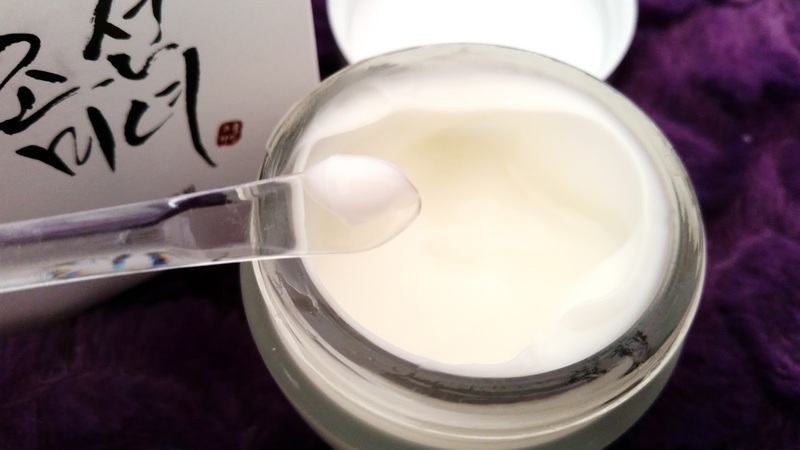 It is good to note that a little goes a long way for this cream and it is always better to apply a second thin layer if needed than to pile on a lot at once. I am very fond of the skincare properties this cream offers. It is moisturizing and provides hydration that lasts quite a long time. It is nourishing, and leaves my skin feeling soft and plump. Perfect for my normal to dry skin type. It also brightens my skin as well and gives off that healthy glow. I was weary of the cream's anti-aging claims at first. I can tell you that while this cream did provide some anti-aging care, it is not a fountain-of-youth elixir and does not cure all. The cream did help to slightly minimize some of my fine lines and wrinkles but it is not a super big change. I am going to finish my jar and see if it makes a bigger difference. It did, however, restore some elasticity to my skin and added firmness. Michelle's Thoughts: I think I say this for every review but I always start with patch tests when I try new products. It's especially important to test the products because I have sensitive skin and I would like to avoid products that can cause issues for my skin. For this Beauty of Joseon Dynasty Cream, I started with my usual patch tests for a week before moving on to the full face test for 3 weeks. My initial patch test didn't reveal any issues and my 3 weeks test went well for the most part (read on to find out what happened). As I used this cream more and more I started to have a love-hate relationship with it. If you have combo to oily skin like mine, you probably know how picky the skin can be. What works on the oily areas won't be moisturizing enough for the drier areas. What moisturizes well can be too much for the oily parts. For me, my oily part is my T-zone and the rest of my face is a bit drier but not super dry. So, I often find creams/gels that my T-zone likes but the rest of my face doesn't or vise versa. This ended up being one of those creams. The majority of my face (minus the picky T-zone) loves this cream. It feels amazing, keeps it moisturized, nourishes it, and brightens it. The cream does this for my T-zone area too but it does something else that I don't like and that is it causes my T-zone to produce excess sebum. I've even tried applying just a tiny bit and it still makes my T-zone produce excess sebum. So, around week 3 of testing this product, I started to apply my water-gel to my oily T-zone and apply this cream on the rest of my face and it's worked well so far. Final Thoughts: I had a feeling that my mom would end up loving this cream more than I would. Sure enough, that turned out to be the case. This cream offers just about everything she wants for her normal to dry skin. My mom's only wish is that it could offer more anti-aging care. As for me and my combo to oily skin, this cream is probably good for the winter times and maybe spring and fall. As summer approaches, my skin tends to get more oily over all and this cream might be too much for me. Taking into account of everything, this Beauty of Joseon Dynasty Cream is pretty amazing and we are happy to have tried it. Would we purchase it in the future? I think my mom might want to purchase another as it's great for her skin type. As for me, I think I'd like to try something else. Do we think it's worth a try? If you have oily skin, this probably wouldn't be suitable for you. If you have combo skin type, this cream would be good for the drier parts and maybe not so much the oily parts. As for normal to dry or dry skin types, if the skincare properties this cream offers are what you are looking for it would probably be worth it to give it a try. Disclaimer: This product was provided to us for review purposes. All opinions are honest and our own. This post contains some affiliate links, for more information check out the full disclaimer.